RAD Nutrunners offer Battery Torque Multipliers, Electric and Pneumatic Wrench & Nutrunners. RAD Pneumatic Torque Wrench with standard Reaction Arm. 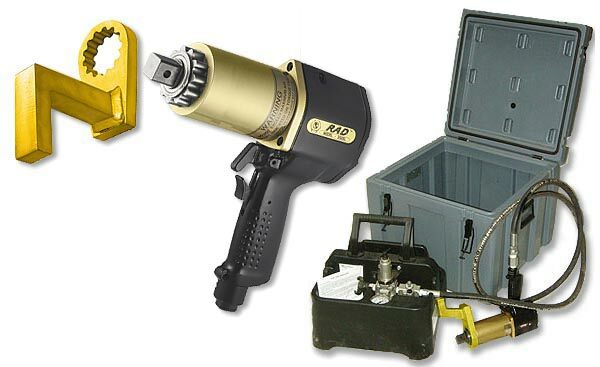 Air Torque Wrench: speed up maintenance & shutdown bolting applications. Pneumatic Nut Runners are the FAST solution for high-torque applications needing up to 2" of thread run down. 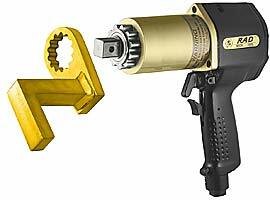 Smooth continuous flow of controlled torque/power eliminating destructive hammering. Highest Power-to-Weight ratio of any air powered Nutrunner tool. Versatile range of 150 ft-lbs. to 8,500 ft-lbs. Each Pneumatic Wrench is individually calibrated and comes with its own torque-chart & Calibration Certificate. RAD-Pneumatic Wrench & Air Nutrunner are planetary gear reduction torque multipliers designed to deliver the most powerful, accurate and safe load of any multiplier on the market today. Our product lines, which include 2-speed pneumatic, electronic, electric, battery powered tools, and Smart Sockets are capable of achieving output values up to 8,500 ft.lbs with an accuracy between 3 – 5%. Pneumatic tools use an Air / Lubro unit between the Tool and the air supply, as seen above. These units provide 3 main functions. They have an adjustable air regulator which is used to set and control the final output of each tool. The Lubricator supplies an automatic drip oil feed to the motor, thus ensures air motor longevity. The water trap helps trap water in the air, preventing the water reaching the air motor. There are many types of reaction arms to enhance the tools usability. Long arms are common for jobs that are unable to secure a reaction using the standard arm. Pneumatic Wrench Applications like Mill Liner bolts, Dozer Tracks, Bridges, Crushers are some of these. Also extended noses fit direct to Tools to allow access to very deep bolts such as those on heavy earthmoving equipment wheel nuts. The Extension Noses can have Reaction Arms at the Square Drive end or Tool.